J.W. Stannard has long been recognized as one of the premier wind chime manufacturers. According to the most recent research, 85-percent of responding consumers bought J.W. Stannard chimes because of the sound quality. The sound is so precise; it is considered a musical instrument. Each tube will maintain the chime's perfect pitch and never rust. Removable hangers slip out to wrap around tree branches or any closed support. Diamond Line, the indestructible fiber used to tether satellites, holds the Stannard chimes together. The top and wind catcher are made from weather resistant hardwood and rubbed with three coats of marine varnish to preserve the natural luster. A JW Stannard Wind Chime requires very little maintenance. Depending on how much rain and sun the wind chime is exposed to, the wood top and clapper may periodically need some wood protection product to help preserve its original beauty. As well, each tube is made of a specially developed metal alloy that is guaranteed to never rust. 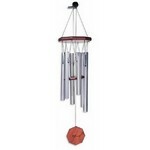 · The higher you hang your chime the more wind velocity it will be subject to. Experiment with your Chime in different locations, if possible. 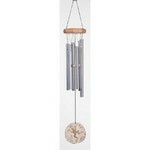 · Hang your chime where it will be clear of obstructions, walls, trees etc. · Hang your chime from a strong hook or bracket, and ensure that it is balanced. 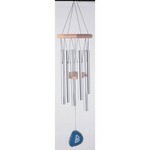 · Hang your chime where the wind can reach it from as many directions as possible. "Received this just yesterday and already love it. It is as advertised, lovely sounding and looks so much more expensive. Look forward to enjoying this beautiful sound for many years..."
"I bought this set of chimes almost a year ago. They look and sound great even after a long winter. I have had so many people asked me about where I purchased them from and wanting them..."
"Gotta say, these are the best wind chimes I've ever had! Beautiful sounding and made well. You won't be disappointed!" "This set of chimes sounds so lovely. It is like having cathedral bells ringing softly all the time. 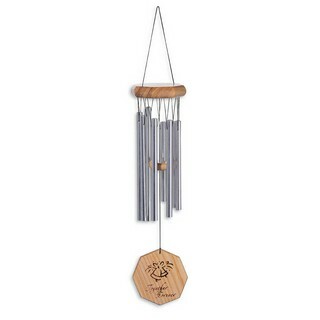 I spend a lot of time at home now due to illness and this is comforting and melodic..."
"This wind chime is so beautiful sounding, I am sure glad I got mine when I did. The neighbors enjoy this wind chime too." "I bought these for my wifes birthday present, she sings in our church choir, and we both love them... They have a great sound to them and are so relaxing to listen to..."
"I received these about 3 weeks ago and have them hanging on my patio. I have always loved wind chimes ,but these by far are the best. 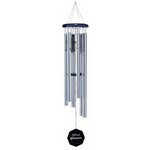 I get compliments from my neighbors..."
"I love to listen to the sound these chimes make. It is peaceful and calming even though the wind is blowing. These are really well made, not your dime store chime..."
"I purchased two of these, and boy am I glad!! One for me, and one for my mother. The sound that these wind chimes produce is just Glorious !!! They are very well made..."
"They are wonderul. The entire familty appreciates these Wind Chimes. They make you wish for a windy day!"